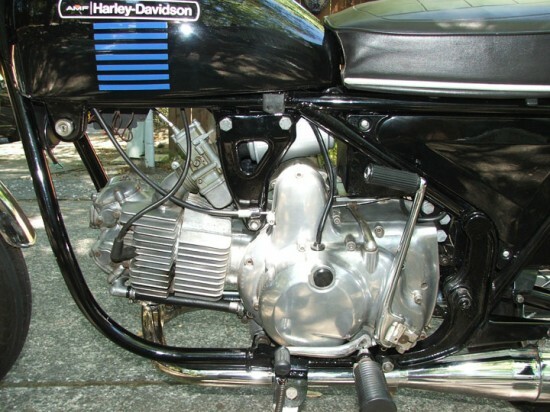 If you were to ask a Aermacchi factory employee what they did there the answer would have seemed a little puzzling until you saw one of these Harley Davidson Branded Italian Motorcycles. What seems even stranger is that a bowling ball manufacturer would buy a motorcycle manufacturer and then hire an airplane manufacturer to build motorcycles. I know I know, that’s not exactly how it happened but it did happen. I’ve had my one these since I first laid eyes on one. These bike aren’t exactly fast and the relationship between HD and Aermacchi didn’t last long. To my eye though the classic Italian design combined with the color schemes of 70’s HD’s always create an undeniable beauty. This one with it’s classic black, AMF logo, red,white and blue stripes really captures the era. The seller is straight the point with shipping offered to the lower 48 states at a reasonable cost. Here it is in his words. 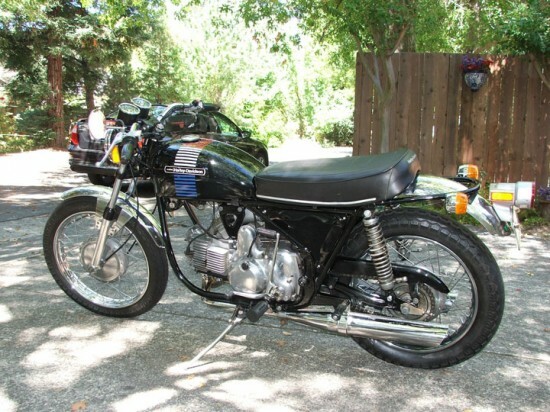 1973 Sprint 350 with 10,328 original miles. This bike looks and runs great. It has both an electric and kick starter. It has a five speed left side shift. There are no dents or dings in the frame, tank and fenders. There is a slight tear, just under an inch long on the left side of the seat, which can be seen in the photos. It has a new battery and starts right away and runs strong. This beautiful Sprint is all original except the handlebars. 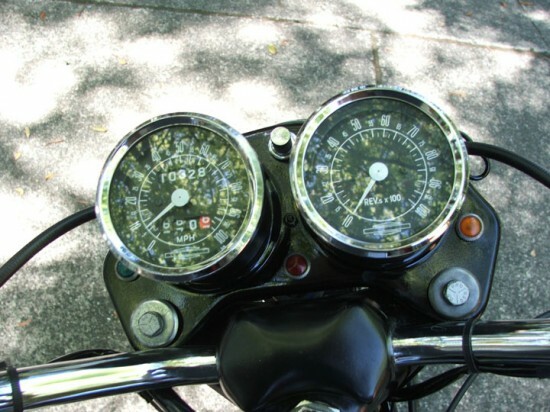 However, the original bars and front turn signals are included, along with the original tool kit and owners manual. The lights, brake lights, horn, turn signals all work. The instrument light bulbs need to be replaced. Always garaged, covered, never dropped or ridden in the rain. It has a clear and current California registration and I have the title in hand. I’m happy to recommend a door-to-door shipping service to almost anywhere in the lower 48 states for $663 or less. A PayPal deposit of $500 is due within 24 hours of auction’s end. The balance to be paid via check, cash or wire transfer within seven working days of auction’s end. The 350 cc Sprint has to be one of the best options if you’re looking for one of these. I think these are a perfect around town bike. Just a clean little slice of American, Italian, Motorcycle, bowling ball and Airplane history. 🙂 The doesn’t have superior speed or collect-ability but it does carry a very unique design. Sometimes that’s good enough to make the decision tot take ownership. Some things to point out though. This bike has electric start and is all original except the bars. If you want a Aermacchi sprint I’ve read that this is the best one to get. Previous story Can I see your papers?